Love’s travel stop in Florida won’t allow truck parking during bike week. 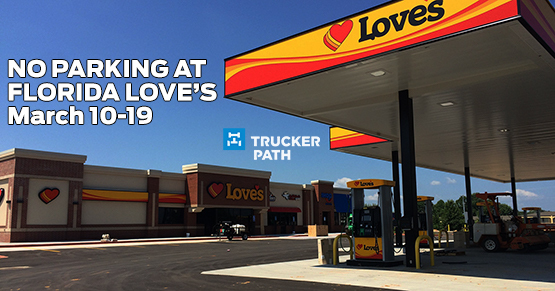 The Love’s travel stop in Ormond Beach of I-95 will not allow trucks to park from March 10–19 due to the increased traffic resulting from Bike Week. In the past, local law enforcement officials say there have been up to three miles of backups on I-1 and 1-95 near the Love’s location because of the event. Trucks will still be allowed to fuel up at the location. There are over 7,000 locations for parking in the Trucker Path app. Be sure to plan ahead to find locations with available truck parking nearby. Search for TA & Petro, Pilot & Flying J, independent truck stops and Walmarts that allow overnight truck parking. Love’s Location: 1657 US Hwy 1, Ormond Beach, FL 32174.